4-Color Process uses Cyan, Magenta, Yellow, and Black inks. When applied in successive layers, these 4 ink colors create a full color image. 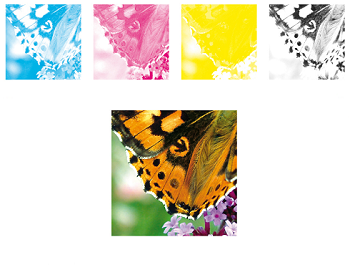 4-Color Process is the most widely used method for printing full-color images. All commercial printers use the 4-Color Process method for projects that contain multi-colored designs or photographs. This includes books, catalogs, manuals, magazines, brochures, postcards and any other printed items that contain full color images. Because of its widespread use in both offset and digital printing, 4-Color Process is much more affordable today than in years past. As its name implies, 4 ink colors are used in 4-Color Process printing. These four colors are Cyan, Magenta, Yellow, and Black…which are known collectively as CMYK. In fact, 4-Color Process printing is frequently referred to as CMYK printing. It is also known as Four Color Printing, 4CP, Full Color Printing, or simply Process Printing. Full-color images are created on the printing press by applying separate layers of the Cyan, Magenta, Yellow and Black inks. Thousands of colors can be reproduced by overlapping these CMYK colors in various concentrations. Applied as tiny dots on the paper (or other substrate), the four CMYK colors combine to create the visual effect we know as full color printing. 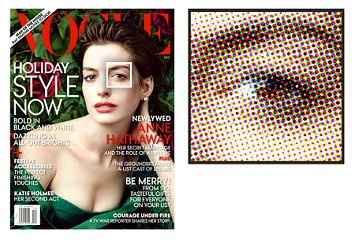 Look at the photographs in a printed magazine or brochure under strong magnification and you will see the distinct CMYK dots. Can 4-Color Process Printing create every Color Imaginable? No. Sometimes there are certain colors that cannot be reproduced exactly using the 4-Color Process method. In this case, PMS colors (also known as Spot colors or Pantone Matching System colors) are used to create a particular color. PMS colors are specific color formulas that will reproduce accurately in print. Instead of simulating colors by layering multiple ink colors with the CMYK 4-Color Process, PMS ink colors are pre-mixed from existing color formulas and assigned a standardized number. PMS colors are often used in conjunction with the four CMYK process colors on certain projects. These are referred to as 5-color or 6-color projects because they use the four CMYK colors plus one or two PMS colors (or more) for certain elements of the design, such as a corporate logo. PMS colors generally involve an upcharge, so they are usually reserved for projects that require a specific color (or colors) that cannot be reproduced accurately by layering the four CMYK colors. Only a small percentage of full-color projects necessitate the addition of PMS colors because most graphic designers refer to a Pantone Process Book and then use the process color formula that is closest to the desired PMS Spot color. So if you intend to print the entire piece using CMYK 4-color process, it is important that you don’t designate PMS Spot colors in your artwork design. Otherwise when your PMS Spot color is converted to a CMYK process color to create printed output, it could yield a result you weren’t anticipating. If in doubt, always consult with your printer before getting too deep into your project. RGB stands for Red, Green and Blue. The colors you see on your computer monitor are created from RGB colors, as are the colors produced by digital cameras, scanners and most desktop printers. RGB and CMYK are completely different color modes, so don’t submit RGB artwork files if you intend to print your project using CMYK 4-color process. If you submit RGB files, they will need to be converted to CMYK prior to printing. This could become an issue because many RGB colors cannot be duplicated accurately using the CMYK process. So, there will be some variance between the RGB colors that are generated by your computer monitor (or desktop printer) and the CMYK colors on the finished printed pieces. For example, an RGB color that looked bright on your monitor may turn into a subdued color when your document is printed in CMYK. Additionally, the hues might be vastly different. Thus, it is important that you always set up your artwork file(s) in CMYK and consult a Pantone Process book to see how the colors will appear as printed output. This will help prevent any unexpected results. If you have any questions about 4-Color Process Printing, just give Formax a call at 866-367-6221. Or, if you have an upcoming print project and would like a quote, click here to access our easy quote request form. We look forward to assisting with your next print project! Related Article: What do terms like 4/4, 4/1, 4/0, 1/1 and 1/0 mean?